You may have experienced intermittent connection problems when visiting the Paterson Times website in the past twenty-four hours. Our Chicago data center has been experiencing internet connectivity issues which are being resolved. Please bear with us as technicians work to address the connectivity problem. Our series of articles on Gaeta Recycling from the past year won second-place in the Best Local News category in the 2015 Excellence in Journalism Awards from the New Jersey Society of Professional Journalists (NJ-SPJ). Second place means we have no choice, but to worker harder for first place. We update our salary databases every year. Access to the Paterson Times website was patchy for the past two hours because our techies were upgrading the platforms Open Graph code. Sorry about that. We're happy to announce the upgrade has been completed successfully. Article shared on Facebook. See author name inside red box. When you share our articles on social media sites like Facebook you will now see authors name listed underneath the articles. It's not revolutionary or anything but pretty useful. Image shows a Paterson Times story on Google News. You can now search and locate our stories from Google News. 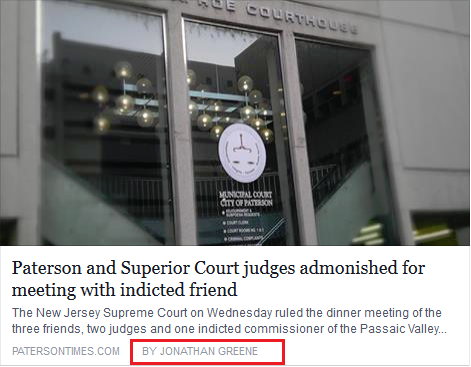 Last week, the internet giant approved the inclusion of Paterson Times on its news service.